Above Board Chamber of Florida presents “Investing in Southwest Florida Businesses,” a unique opportunity for local professionals to hear from a panel of experts on how Southwest Florida businesses can attract foreign investors. This luncheon will take place on Tuesday, October 15th from 11:30 – 1 p.m. at The Landings Yacht, Golf and Tennis Club, located at 4425 S. Landings Drive in Fort Myers. The panel of experts includes Ita Nemoytin, an attorney who was appointed by Governor Scott as the Regional Conflict Counsel for the Second DCA; Frank Abernathy, attorney and owner of EFS Investment Partners, who dedicates time to fostering positive political relations between the U.S. and other countries; and Leonardo Garcia, owner of the Hispanic American Business Alliance (HABA), who serves on the Dominican Republic Presidential board for Dominicans Abroad – Florida Chapter and has been collaborating with SWFL International Airport to bring direct flights between SW Florida and Latin America and the Caribbean. The panel will discuss why Southwest Florida is attractive to foreign investors, and what foreign investment would mean to our local economy. The experts will identify what foreign investors look for in local businesses and share strategies for making your business look more attractive to foreign investors or buyers. This is a great opportunity for local businesses to explore funding and expansion options outside of the U.S. This event is open to the public and ideal for anyone who is interested in taking advantage of a valuable opportunity to learn more about attracting investors from abroad. RSVP is required. If you sign up and pay before October 11th, admission is $22 for members and $28 for non-members. After this date, admission is $28 for members and $32 for non-members. The event is sponsored by Leo Kremenchuker from the Kremenchuker Law Firm and the moderator for the discussion will be Brian Hamman, Manager of Marketing Development with CenturyLink. This event is expected to fill up fast, so be sure to secure your RSVP today! 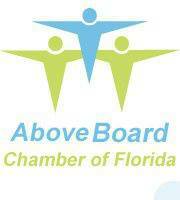 For more information on the event or on how to become a member of the Above Board Chamber, contact Jeanne Sweeney at 239-910.7426 or visit www.aboveboardchamber.com.